Excitement is growing about the start of a new era at Selsey as Daren Pearce builds his squad and backroom team. Pearce says his squad is coming together nicely and he is looking forward to the challenge of managing the Blues in division one of the SCFL as well as playing a key role in overseeing the long-term future of the club. We also have the added bonus of a under-18s side who will play in the under-18 county league. This side will be managed by Dale Hayes who will be assisted by Ben Richer and Connor Kelly. This will help the route towards the first team and give lads the opportunity they need. Pearce effectively swapped jobs with Steve Bailey at the end of the season, Pearce switching from Sidlesham to the High Street Ground and Bailey going in the other direction. Pearce told the Observer: “I was pleasantly surprised that Dave Lee approached me regarding the manager’s job. It wasn’t a hard decision saying ‘yes’ as I played there a few years ago and enjoyed my time there immensely. “The support they have as a club is fantastic and this is a great opportunity for me to take up the challenge of progressing the club further. “Selsey FC are a great traditional football club on a sound footing and have the added extra of a youth section which will be an important part of my future at the football club. “The development of players coming through from the youth section and into the under-18s, under-23s and first team is a must for a club at our level as we want to provide a club for local lads who come up through the youth teams. They then have a place to play once they have finished their youth development and push through into adult football. “I’ve been lucky enough to get Greg Robinson, who I’ve worked with before, as my assistant manager and keep Ben Richer on as first-team coach. I’ve known Ben since I played there under Danny Hinshelwood and he is a massive part of Selsey FC. These two will be a big part of our structure over the coming seasons. “We have new managers and coaches coming in the shape of Miley Rodgers, Joe Leggatt and coach Simon Whall to take our under-23s development squad. “We also have the added bonus of a under-18s side who will play in the under-18 county league. This side will be managed by Dale Hayes who will be assisted by Ben Richer and Connor Kelly. This will help the route towards the first team and give lads the opportunity they need. “On the player front we’ve had a good recruitment drive in the summer and added some players who we worked with last season to some local talent that was there last season. Players on the books for the new season include Ryan Morey, Dale Hayes, Connor Kelly, Tom Kelly, Harry Gregory, Liam Bush, Dan Bassil, Callum Dowdell, Callum Britton, Bradley Higgins-Pearce, Oli Hambleton, Curtis Poole and George Briance. Pearce added: “There are a few but more signed and committed as well. “We’re looking to progress year on year and push the club back to where we think it belongs and this will only be achieved with hard work and the desire from the players and staff. 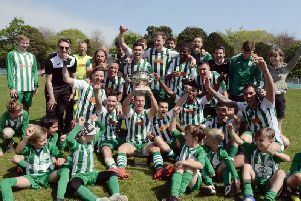 “A nice run in the FA Vase or the cups is always a welcome distraction and although the league is the main priority these can be financially rewarding for a club at our level. Selsey begin their programme of pre-season friendlies at home to Horndean next Tuesday.